12/11 –The Parker Firm completed a 2 and ½ week trial in Corpus Christi, TX in connection with the Delek Refinery Explosion in 2008. 9/11-Parker Firm gets verdict -Representation of Defendant in MVA where 2 Plaintiffs were involved and a Co-Defendant. The jury found our Defendant was not negligent and awarded the Plaintiff zero damages. The Jury placed negligence on the Co-Defendant with a total verdict of $11,585.11 against the Co-Defendant. Verdict was in Gregg County (Longview, Texas). Parker Firm recently retained by a lady who is sued for wrongful death by step children for taking partner off of life support. 5/11-Parker Firm gets verdict – Representation of Defendant in MVA where Plaintiff alleged Defendant negligently turned in front of Plaintiff while pulling into a private driveway. Plaintiff alleged lower back and neck pain with past medical expenses in the amount of $3,153.78 and claimed $4,800.00 in lost wages. The jury placed 50% of negligence on Plaintiff and 50% of negligence on Defendant and awarded damages to the Plaintiff in the amount of $3,976.89 of the total damages. Verdict was in Cherokee County (Rusk, Texas). 4/11-Parker firm gets verdict – Representation of Defendant in a MVA where Plaintiff alleged Defendant negligently failed to yield the right of way from a private driveway. The jury found Defendant was not negligent and awarded the Plaintiff zero damages. Verdict was in Gregg County (Longview, Texas).Chad Parker of the Parker Firm recently retained by a large heavy haul company upon allegations that the driver’s negligence resulted in death of motorist in Nacogdoches County.Chad Parker of the Parker Firm recently retained by an Oil and Gas Company to defend driver in fatality accident involving a person in Shelby County. Chad Parker of the Parker Firm recently retained by Parallel Petroleum (oil & gas operator)to defend surface damage, nuisance, trespass allegations by land owner. 3/17 – Parker Firm gets verdict – Jury finds Plaintiff negligent and finds that the Defendant was not negligent. Trial related to an automobile collision with the Plaintiff who was riding a bicycle at the time of the incident. Verdict was received in McLennan County (Waco, Texas) on March 17, 2011 and was a unanimous verdict. 11/10 – Parker Firm Retained – The Parker Firm retained by large working interest owner to sue company for fraudulently inducing him into investing in well. 11/10 – Parker Firm Retained – The Parker Firm was recently retained by an Oil and Gas operator to file a dec action against a former consultant to construe rights and defend counterclaim. 10/10 – Parker Firm Retained – The Parker Firm was recently retained by a service company in a suit brought by an operator alleging their failure to include certain chemicals. The frac job resulted in a significant decrease in production. 10/10 – Parker Firm Retained – The Parker Firm was recently retained in August as local counsel in a patent case on behalf of Fortress Technologies, Inc.
10/10 – Parker Firm Retained – The Parker Firm was retained in August on behalf of a major drilling contractor to defend allegations they were negligent in loading of surface casing resulting in injuries to a third party contractor. 6/10 – Parker Firm Gets Verdict – Jury awards only a portion of two Plaintiff’s medical. 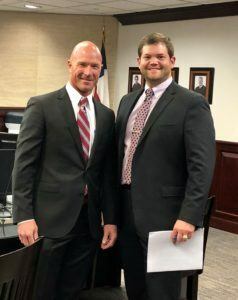 The award did not include chiropractic care or physical therapy following a motor vehicle accident in which the Defendant’s were found to be at 100% at fault . 5/10 Parker Firm Retained – Recently retained by Oil & Gas Operator in significant Royalty Dispute. 5/10 Parker Firm Retained – Recently retained to Defend large Tubular Company in suit alleging product defect resulting in down hole failure. 5/10 Parker Firm Retained – Recently retained in crash worthy case to defend component part manufacturer of suspension lift. The Parker Firm, P.C. is located in Tyler, TX and serves clients all over North East Texas.